British White Ensign with Golf Clubs? I have been sent a UFE which might be described as a St. George's flag, but with the cross shifted toward the hoist and also toward the top. The correspondent who sent this to me had seen it in several locations in Georgia (US), and in North and South Carolina. He has seen it flown in connection with the Confederate battle flag, and assumed it had a Confederate connection. I am not familiar with the use of such a flag in any connection with the CSA Can anyone identify this flag? There is a flag for "The North of England" which is similar. The red cross on the white field is a Scandinavian style cross, but this UFE also seems to have the cross ride up towards the top of the flag. In any event, I have no idea why any such flag (other than the St. George of England) would be seen in several locations in Britain's former coastal provinces south of Virginia! Well, it's not an identification, but the North of England flag mentioned above in the second paragraph is a flag proposal, not an actual flag. This enquiry is really just about the UFE shown here, not the second flag. The flag appears to be a red X in the upper left-hand corner on a medium blue field. My great-grandfather Adolf was in US Cavalry in the Spanish American war stationed in Cuba, 1898. While there, a comrade (who was an architect's assistant) made him a present of these architectural plans of a castle painted by a senior associate. The plans are dated 1822, but otherwise have no other information. The plans do not indicate the country in which the castle is located. My grandmother told me the castle was "owned by a Spanish prince." But Spain was in control of many countries in those days. The blueprints are in English. 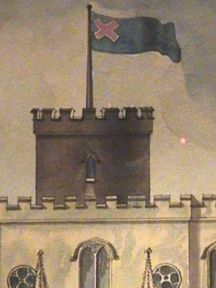 I was wondering if the flag (if it is genuine, and not an artist's rendition of a banner) could be a possible clue to the location of this castle. Any help you could give me would be greatly appreciated! The first thing that popped in my mind was "badly rendered British blue ensign". I have someone who called me about a flag they are flying. They said it has 5 horizontal stripes of Orange-White-Blue-Yellow-Lime Green. I have no further information. A pure hypothesis, some kind of Chinese flag. 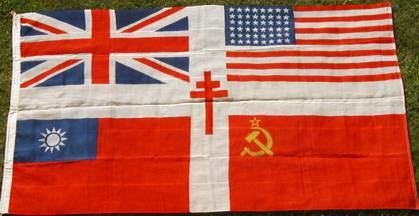 There have been quite a few imperial rank flags with various colours so this arrangement might just be one we haven't got yet (especially if the orange bit is a faded red). If this is an old flag, especially if it is one made of wool bunting and the orange and green are faded, then it may be of great interest. During the Anglo-Boer War of 1899-1902, Transvaal and Orange Free State forces combined against the British. This involved also the fielding of mixed units with men from both states. Some of these units used flags to designate headquarters which combined the colours of the two countries. The Transvaal colours were red, white, blue and green; those of the orange Free State were red, white, blue and orange. In one or two cases, the orange was replaced by yellow (perhaps through inability to obtain orange-coloured material). Several of these so-called "vyfkleur" (five-coloured) flags exist. This may be one of them. I would need to see a picture of the flag or (better still) to examine the actual item to be more certain of this. While watching the third day of the first cricket test between England and South Africa at St Georges Park in Port Elizabeth on TV this afternoon my attention was occasionally distracted by the Barmy Army. They were there in some strength, well tanked up and in good voice. Many St. George crosses waving about especially when the English team did something they approved of. There were among Barmy Army many members wearing the cross of St George on their T-shirts. There were also a few who wore a red cross Branchee or Fichee also on their T-shirts. Would this be only a private variation of St. Georges cross among this crowd or has it some sporting connection like a cricket club flag that you know of? I suggest that this flag may be a remnant of either the Knights Templar or the Knights Hospitalier. The flag in question (on left) has been positively identified and moved to its permanent location on FOTW as "Claude Monet's Terrasse à Sainte-Adresse." I saw this flag recently, but I can't identify it. It's divided diagonally from the lower-hoist corner to the upper-fly corner. The upper triangle is blue and the lower is red, with a yellow stripe dividing the triangles. The southern cross is in the canton. I think it's Australian, but I'm not sure. This might be one of the entries to the Australia Flag Competition to design a new flag for Australia, although I can't find an exact match on the web page. This flag was identified as a variant of the nine-striped Princevlag and is now located on its proper page. Yesterday I saw a car that had a license tag with what was compositionally the flag of Morocco but instead of a green star on plain red background, the colors were reversed—I modified the Morocco flag to obtain pretty much exactly the emblem I saw on this fellow's car. Do you know what the flag represents? Is it some nation close to Morocco or a region within Morocco or something else? It just bugged me that I couldn't find out what it is! I would be grateful for any help you can give me. Among your list of unidentified flags I found the Moroccan flag but reversed, (green with a red star). When I visited Morocco back in 1973 I saw this flag and asked what it was. It was flying over a building in Tetuan. I was told that it was a religious flag in Morocco. Any idea what this flag represented? It measures 2' by 2'. I thought the three stars and five arrows would be a clue, but couldn't find anything like it. I very much doubt this identification. The eagle looks nothing like any eagle that ever appeared on a US Army flag of this period (see the North Dakota state flag for the normal portrayal of the time); no such flag appears in any edition of Army Regulations from the 1820s onward, or in any War Department General Order; a 2 x 2 foot (60 cm square) flag seems awfully small for the purpose stated; and, most tellingly of all, if "late 19th century to pre-WWI" means 1875 to 1914, there was never at any time more than one 3-star (lieutenant) general in the Army, and for 19 of the 39 years none at all. Not to mention that there were no corps headquarters in the US Army between the Civil War (1865) and the Spanish American War (1898) or from then until American troops started arriving in France in large numbers in 1918. Or that the one state that both the 19th century lieutenant generals came from--Ohio--didn't adopt its state flag until 1902. The flag is a square, this indicates that it is a military flag. There is no eagle depicted, but a falcon instead. The Saladin falcon or the Quraish falcon is depicted in the coat-of-arms of those Arabian states, that built the so-called "United Arab Republic", i.e. Egypt, Libya, Syria and Iraq, also in the flag of Egypt. The Quraishis are the tribe the prophet Muhammad belonged to. The red colour shows that it is neither air force (celestial blue) nor navy (dark blue). So it has to be army or ministry of defence. The heraldry of the depicted flag is influenced by the heraldry of US-flags, see for example ZNAMIEROWSKI: "Flaggen-Enzyklopedie" (ISBN 3-7688-1251-0) p.69 and p.70. There are depicted the flags of the Secretary of War (p.69) and the Secretary of Defense (p.70) which seems to be the same. Like the eagle in the US-flags the falcon holds a bundle of thunderbolts or arrows in his left claw (fly end) as a symbol of war and a branch of an olive tree in his right claw (hoist) as a symbol of peace. I suppose, it is a flag of the new armed forces of Iraq which are rebuilt by the US-forces since 2001. There are only three stars. This seems to indicate a lower rank than the Iraqi Secretary of Defense. It may also be the rank flag of a 3-stars general of the Iraqi army. This image appears as avatar for some guy calling himself "Scooterdog" from Montana who claimes to be a "Slayer of mythical creatures." on the The Law Network blog. Scooterdog's profile ...[would indicate]...it is very likely he got the flag image from us, not the opposite. Ivan, did you get (and keep) a larger image? Does it look like a photo of an actual flag? Is it possible to contact the original poster? This is a picture of a WW II "patchwork" flag that an English patient of mine found in her attic, and that she wishes to sell. I have already seen pictures of patchwork flags, mainly of WW I, but in 40 years of study of vexillology I had never seen a flag like this. It is in wool, 4x6', and in good condition. Any information and comments about this flag would be welcome. That's not so much an "unknown" flag -- it doesn't stand for an entity -- but is rather a pastiche of allied flags in WWII (UK, US, China, and USSR with the Free French Cross of Lorraine in the center.) It likely hung on a wall rather than flew free. My guess is that it's a flag for the Free French Forces (or supporters of them) during WWII. The Lorraine cross in the middle hints at this, and the use of the flag of the main allied nations could be a way to emphasize the joint effort in the war and also the French tricolor could probably look to much like the flag of Vichy France. I am a French militaria collector and I possess this flag. Could you help me to identify it? Perhaps it is a XIXth century, German flag? The flames strongly suggest a Swiss regiment in foreign service, but I am afraid I cannot place it. It is not French. The two-headed eagle doesn't seem quite right for the Austrian Empire. 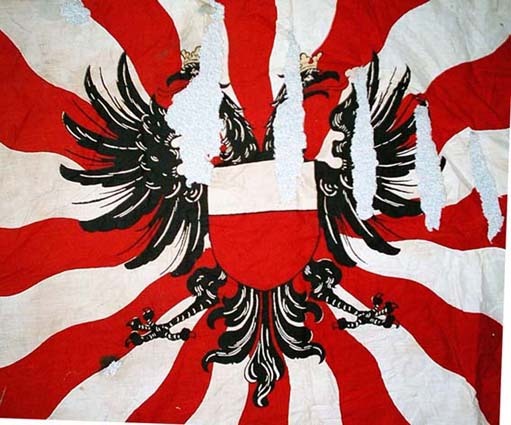 Just a wild guess: The county of Hohenberg (which was located in what is now central Baden-Württemberg in Germany) used a white-red shield like the breast shield on the eagle. Hohenberg belonged to Austria until 1805. The double eagle could be Austrian. However, that's my complete extent of knowledge on this matter. The flamed gyronny flag is traditional in Central-Europe, but the arms are also of the Hanzestadt Luebeck in Northern-Germany. And in the Regions in East-Schleswig-Holstein one can find shields gyronny in white and red. The double eagle seem to suggest Russia. The crowns on the heads are however, not Russian. The colours indicate Poland, and the crowns seem similar to the crown on the Polish eagle. Hence, my guess is, that there is a Polish connection here, e.g., Poland during the time of Russian "occupation" prior to WWI. At the first glance for me it was a military flag of the Hansestadt Lübeck. The crowned double eagle is the symbol of the Holy Roman Empire. The bicolour inescutcheon is the distinction mark of Lübeck. The gyronny pattern was used by the Swiss, also of those regiments in foreign services. This is affirmed by ZNAMIEROWSKI and NEUBECKER. But for me it is hard to believe, that Swiss soldiers were in service of a sea power like Lübeck. In addition red and white have been the colours of Hansa league. There is another detail, I cannot recognize properly. I can't see, whether the eagle has two halves of a torn chain at both feet or they are simply the fourth toes of the eagles claws. If it was a torn chain, than the flag could belong to the Hanseatic Legion, a militia that joined the alliance against France in times of French occupation(1810-1813). You can see a flag of that militia in "Die Welt in Bildern, Band 8, Historische Flaggen" p.48, image 176. The depicted flag is white with a golden border of fringes. In the middle is a red Latin cross with a golden "1813" upon the horizontal crossbar. In the hoist corners there are eagles of Lübeck with their tails pointing to the flags corners. Below the cross is a golden inscription (half circle) "Deutschland oder Tod!" (Germany or death). From the image alone it is basically impossible to know what this flag is. One would have to do some (at least superficial) analysis of the textile material and the colours etc. to find out the age of the flag first. It is quite probable that it is not a true military flag, but some flag of a veterans' association or the like. These are single items and therefore difficult to identify. the fabric is pure cotton. The flag features an obvious patina which is not visible on the picture, but the lack of parts probably eaten by a rodent. I have other cloth relics and I think that this kind of patina would appear after 50 or 100 years at least. The cotton is quite grimy! Some of the colors have not been printed exactly into the drawing, as colored illustrations in old illustrated books. Anyway, thanks to all for the answers. It is, definitely, neither a Polish or a Russian flag. The eagle appears to be an Austrian one, but, most likely is representing the Holy Roman Empire, and the shield is that of Lübeck, so, the speculation of Klaus-Michael Schneider seems to be the most plausible, although not a conclusive one. Sorry for not being able to untangle the mystery. This flag could have a link to the city of Lausanne, Switzerland. The red part of the shield looks larger than the white, like Lausannes (gueules chappé d'argent in heraldic French), and the district of La Palud in Lausanne had the imperial eagle on its banner in medieval times. I spotted the attached flag in an antique store here in Woodland. It is unidentified and is priced at $50.00 US. It is a swallowtail. Starting at the hoist are red, white and blue vertical bands approx 4-1-4 to about half the lenght. The tail portion is divided into red, white and blue horizontal bands at about the same ratio of 4-1-4. I didn't get exact measurements, if they are important I can go back. Any ideas? I believe the flag is actually a yacht club pennant from a Bay area club. I'm not sure which one. This info is only slightly better than a guess, I just recall seeing a similar scheme on yachts in SF bay. This is pure speculation, but I've been looking at this image for some time and always wondered if it was actually two signal type flags sewn together instead of one, like illustrated above? What they would mean is anybody´s guess, but the top one is the ICS signal flag for Tango. During BBC coverage of the Open at Troon (Scotland) I noticed a flag on the clubhouse flag pole which seemed to be a White Ensign with crossed golf clubs in the bottom left hand quadrant. I suspect it might have a connection to Duke of York who is president (?) of the Royal & Ancient, but haven't found anything to confirm this. Can any of your experts shed any light on this? I frequently see a flag on a house in my neighbourhood that is decidedly out of place. It looks like a standard Czech flag, but has a single rather large 5-pointed white star in the middle of the blue triangular field. It looks a lot like Texas too. Looking for assistance in identifying the shipping line for which the Cadzow Forest sailed. She was a bark, built in Glasgow, Scotland, by Russell & Co. in 1878 and hauled cargo between Britain and Australia from 1878-1896. She was eventually wrecked at the mouth of the Columbia River (USA) in 1896. The flag is described as "A house flag, of a white ground, with a red cross edged with blue, and blue letters. Interestingly, we are quoted, and sourced, at Rootsweb, which includes the additional "CADZOW FOREST was a 1,068 gross ton bark, built 1878 and owned by J. Pollock & Co, Glasgow. Later owned by J. C. King & Co, Glasgow." Assuming this is correct, it would more or less answer the original question about the shipping line. It doesn't answer our specific interest of what the flag might have looked like. Quite the contrary: We now have two companies to find flags for, of which the description most likely covers only one. The original question, as we have it, says: "The flag is described as"; I wonder: does that mean that's a quote from a source writing about that ship, and flag? As it happens, the person originally starting the topic at rootsweb, a John Kirkwood, was wondering about the flag on the ship too: "I am interested if she carried a flag of the duke of Hamilton". Do we know what such a flag would have looked like? My name is Jamie Hubbs and I am George Hubbs' son. I would like to apologize for gross delay in answering everyone's responses. My father was new to a MAC computer at the time and may have not seen your e-mail update. Here are some b/w and color e-drawings of the flag. 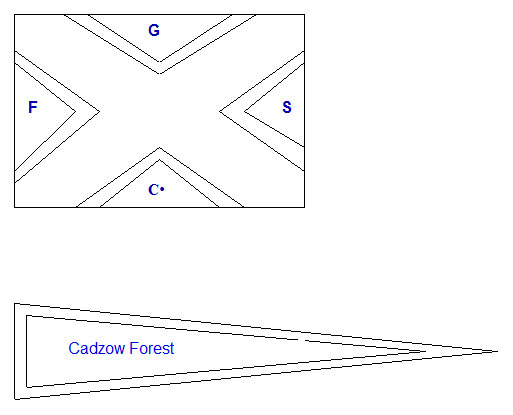 Thank you for all the research done by the FOTW members concerning the identification of the flag flown by the Cadzow Forest. In answer to one of the members questions: The source of the flag's design was a copy of Russell & Co.´s original "Cost Book," for the ship. A cartoon of the flag, and written instructions for the colours and the placement of the letters was provided on a page of the Cost Book. So, I on my own behalf, I would like to ask the members of the FOTW for help in identifying the actual name of the passenger and/or freight company the ship was sailing under. Well, if the builder's cost book shows the flag, but gives no hint of the owner, that doesn't give us much. Still: According to an article from The Argus (Melbourne, Vic, Wednesday, 24 July 1878), the ship sailed the White Star Line of Packets, under J. Pollock. At Wreck Site, J. Pollock & Co., Glasgow are given as 1878 and later owners. In all I would say the Cadzow Forest was a captain-owned ship, probably financed with private shares. As such, the letters G and F could refer to anything in the Glasgow and Firth area, and it would be a lucky hit to find a matching company name. But I would like to single out the one thing that would be verifiable: Are we sure the letters aren't C F S Co - Cadzow Forest Shipping Company? At some point the ship apparently was sold, but the flag in the Cost Book would have been that of the first company. I've seen a flag, hoisted on a big motorboat, in the Netherlands. It's a black flag, with a yellow rectangle in the middle. I hope you know what this flag stands for. I recently came across this officers cap at a sale and I have made quite a few enquiries but nobody seems to know anything about it, some have said it looks Japanese. Have you come across this badge at all. 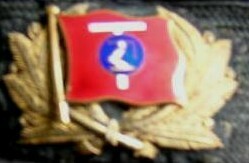 The arm in the centre of badge is wearing armour. The flag is the one of JOSEPH L. THOMPSON & SONS Ltd.: a famous ship yard at Sunderland, England. This company was involved in the first design of the Liberty Ships. Why did a shipyard have to use an officer cap badge? Certainly for the test & trial crew before official flagging of the new ship to her owner. Source: Loughran (1979), page 79. I would like to identify a Naval flag that is depicted in a Roy Cross painting of a Clipper ship in the Arctic. The flag in question is flying at the top of the main mast, is square, has a blue field and a white circle in the centre. The only things that I can find that are similar is either the "Blue Peter' or a pendant representing the number 2. Have you any ideas? Since a blue flag with a white circle does not appear in either Marryat's code of 1824, or in the Commercial (International) Code of Signals of 1857-1900 (although there is "a pendant blue with a white ball" as Austin indicates above), can we reasonably assume that it is either a private signal of some sort, or a house flag? A single flag at a masthead is probably a house flag rather than a signal flag. 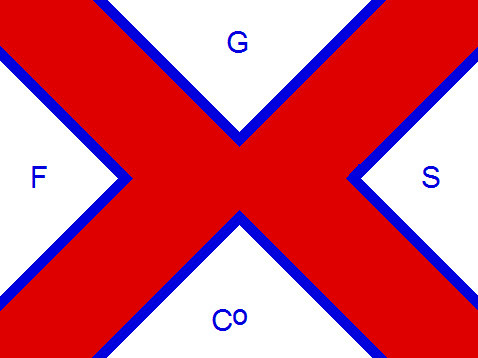 Four or five steam-ship companies had a house flag like this. A red flag with a thin white cross and a thin white saltire was prominently displayed in the stand of the stadium of Sfax, during the quarter finals Morocco-Algeria of the Africa Nations' Cup last Sunday. The flag is probably a club supporters´ flag, but I have no clue on the club it represented. The Algerian supporters outnumbered the Moroccans, but such a red flag looks, at first sight, rather Moroccan than Algerian. An element of answer might be given during the semi-finals: if the flag is still there, it is Moroccan, if it is no longer there, no straight conclusion is possible. The football flag from Tunisia looks like a flag belonging to The Wydad of Casablanca.